On a cool and wet Saturday, firefighters made major strides in containing the Mountain Fire, a massive wildfire near Palm Springs that has blackened 27,245 acres, authorities said Saturday night. Firefighters announced Saturday night they had the fire nearly 50 percent contained - up from 15 percent a day earlier. And, for the first time, fire officials estimated they would have the fire fully contained by Friday. Nearly 3,500 firefighters, aided by 30 aircraft, battled the fire, which stretched in elevation from 4,000 feet to 9,000 feet along the mountains, putting crews in temperatures from a comfortable 75 degrees to a scorching 110. 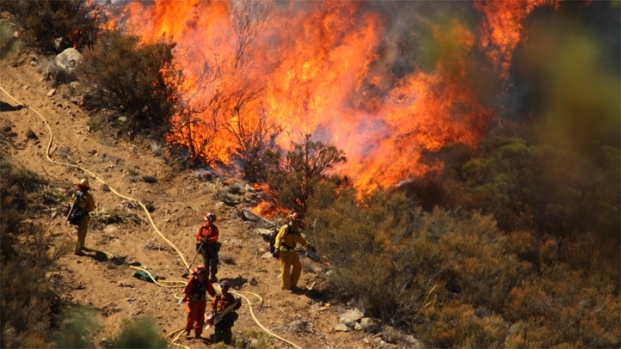 The threat of weekend thunderstorms brought much-needed moisture to the wildfire. But it also brought along some potential hazards - wind, lightning and other volatile conditions that could make a tough firefight even worse. 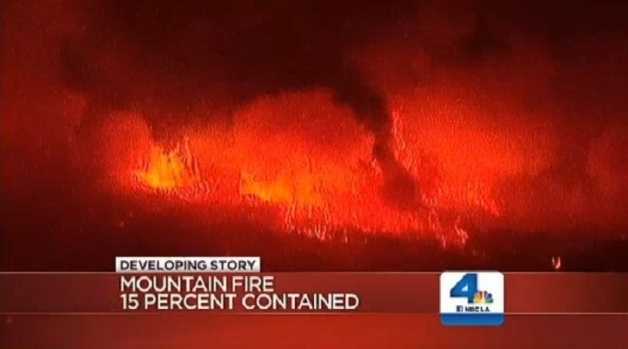 A thunderstorm brought much-needed moisture to an area affected by a massive wildfire. But it also brought some danger - wind, lightning and potential for other weather phenomena that could make matters worse for firefighters. Tena Ezzeddine reports from Lake Hemet, Calif. for NBC4 News at 6 p.m. on Saturday, July 20, 2013. Storm cells approached the area Friday afternoon but dissipated before reaching the fire zone. But the threat would remain on Saturday and through the weekend, and fire officials hoped it would be mild cloud cover and high humidity that could help in the firefight. Lt. Gov. Gavin Newsom, filling in for a vacationing Gov. Jerry Brown, declared a state of emergency for the area Friday night, freeing up more state funding and other resources to help with the protracted firefight that has already cost nearly $11 million. Firefighters braced for the possibility of thunderstorms as the 42-acre Mountain Fire continues to burn near Palm Springs. Patrick Healy reports for Today in LA Weekend on Saturday, July 20, 2013. Mandatory evacuations remained in place for a fourth day for about 6,000 people, and officials had advised another 700 to evacuate. Some communities on the eastern edge of the fire were reopened to residents, but about 5,600 homes remained under potential threat. 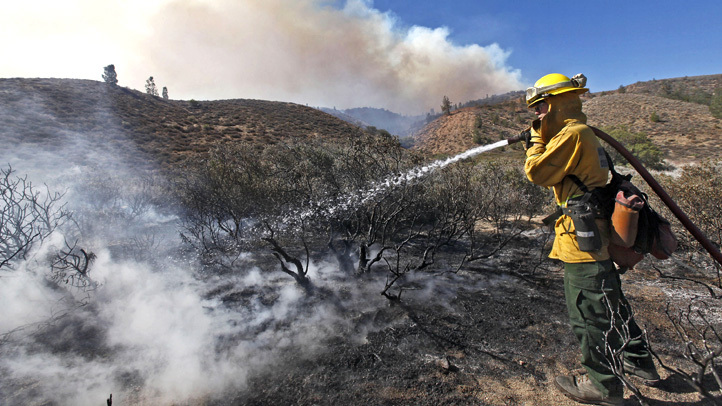 The fire was less than two miles from Idyllwild on its western flank. It was a similar distance from Palm Springs below on the desert floor, where an enormous plume of smoke could be seen, but the blaze was showing little threat of moving toward the much larger city. A very aggressive wildfire burned through 8,000 acres in the dry, rugged San Jacinto Mountains after breaking on Monday afternoon, burning homes and forcing evacuations. 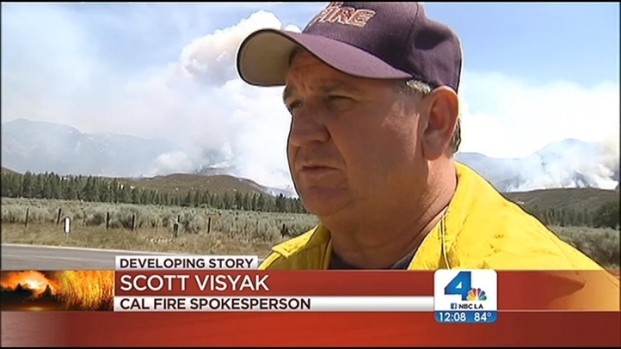 Tony Shin reports from Lake Hemet for the NBC4 News at Noon on July 16, 2013. Popular campgrounds, hiking trails and a 30-mile section of the Pacific Crest Trail, which runs from the Mexican border to Canada, remained closed. Authorities said the fire was human-caused, but they wouldn't say whether it was accidental or intentional. There have been no reports of injuries. The fire, which began Monday, has burned six homes and mobile homes, one cabin, and more than a dozen other buildings. Fire crews are bracing for a windy Friday as a massive wildfire near Idyllwild rages into its fifth day. Chuck Henry reports from Idyllwild for the NBC4 News at 11 p.m. on July 18, 2013. Residents, meanwhile, began returning to their homes to assess the damage. 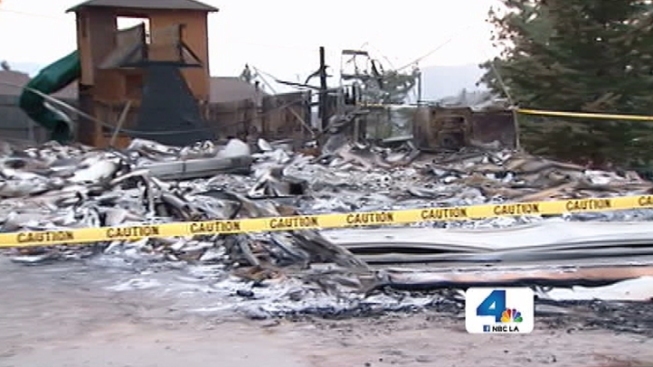 “It’s hard to come back and see your stuff is not there,” said Shanda Paul who lost her home.